Show your cat how much you love her with our Valentines Day Cat Toys. A wonderful idea for the cat or cat lover in your life, our cat toys filled with 100% organic grown catnip, they’re handmade and delivered fresh to your door! A special toy for your much-loved cat! 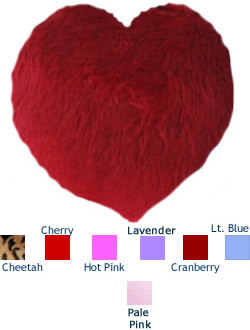 These colorful hearts are filled with our 100% POTENT organic catnip and made from soft minkee fabric. Your cat will love you for thinking of them! * About our Catnip: We use only the finest 100% organic catnip in our toys. It's grown in the USA without pesticides on an organic farm. All of our catnip toys are filled to the brim with our finely cut, long lasting catnip. All of our catnip toys are handmade by one craftswoman in the USA. Our fabrics, polyfill and organic catnip are all high quality. Visit our Cat Bed shop for handmade & Design Your Own Custom Cat Quilts! For the cat who loves a bargain! Visit our Featured Cat Toy of the month for unique pet gifts and discounted Cat Toys ! Join us on facebook. We love to see our happy customers, so please share photos of your cats enjoying their catnip toys!